If unit is adjacent to an ally, grants Atk/Spd/Def/Res +3 during combat. Grants Atk/Spd/Def/Res +4. After combat, deals 8 damage to unit. If a Rally Assist skill is used by unit or target’s unit, inflicts Res -7 on foes in cardinal directions of unit through their next actions. At start of turn, grants Res +6 to ally with the highest Res for 1 turn (Excludes unit). Aside from the return of the loosely-clothed armoured unit, everyone else is on point. I’ve been anticipating Greil for a long time, but I never thought he’d be introduced as a seasonal before his regular variant. A Soren alt was even more unexpected. Overjoyed at the 2019 Tellius love, even if I’m broke on orbs right now. Will summon before this banner expires, but well done on this one IS. Words cannot express how excited I am for this. SOREN HAS AN ALT!!! And I’m here with 20 orbs. I’m dying inside, there’s no way I’m getting anyone. As long as they’re not subhumans I don’t have any problem. Besides,one of them is a former Daein general and the other is the rightful heir of Daein. I hope Greil doesn´t meet the same fate like Charlotte & Noir! I wish he will come in his original form with Elena! YES! Finally another full non-Fates banner. I think I know the two that are gonna be gunned for the most. To be honest this was a bit of a missed opportunity to add Ike and Mist’s mother into the game, I mean yeah at most she’s only mentioned by name and we only ever see her twice in PoR but still (once in that little cutscene of Ike’s memory at the beginning and then another screenshot of her getting stabbed by Greil when Volk was explaining things to Ike). Also to those whom aren’t likely happy Ike got another alt, best to grin and bare it cause he doesn’t have as many as Camilla. You may want to use a spoiler tag for that. You mean for the part about Ike and Mist’s mother? Sure I can do that, even though the game’s been out for years and almost everyone should possibly know about that little tidbit. Definitely, but to me a spoiler is a spoiler regardless of age. This article also has nothing to do with Elena herself, so it’s kinda hard for someone wishing to avoid such a spoiler to do so based on the title. But it’s cool that you complied anyway. No problem, don’t wanna suddenly get banned for something like that. It’s about time we got a dedicated Telius seasonal banner. Even if I’m not interested in this banner, I’m glad others are and I finally have some down time to save my orbs. 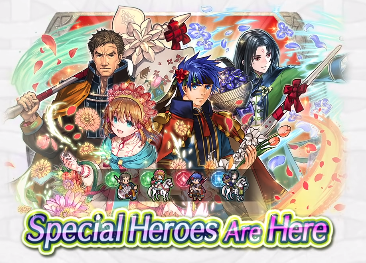 Cool, another banner composed almost entirely of alts. Just what everyone was clamoring for. And the last alt-filled limited banner isn’t even half over yet. They could’ve used the Legendary/Mythic Heroes system to actually offer up something living up to the name and given us Gawain with Urvan or one of the legendary swords. Instead we get a half-assed Greil with a generic axe and a contradictory skill set.